Hi friends! 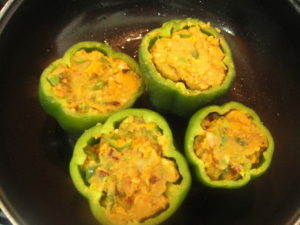 Today’s recipe is ‘Stuffed Bell Pepper’. In this recipe, capsicums are stuffed with spiced potatoes and then either cooked in a pan or microwave. Stuffing for this recipe is prepared from boiled potatoes, peas and carrots. 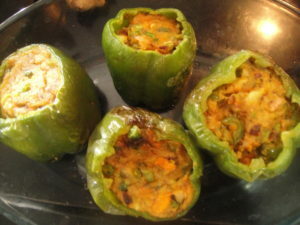 There are many variations of this dish, main ingredients of stuffing can be changed as per your taste. 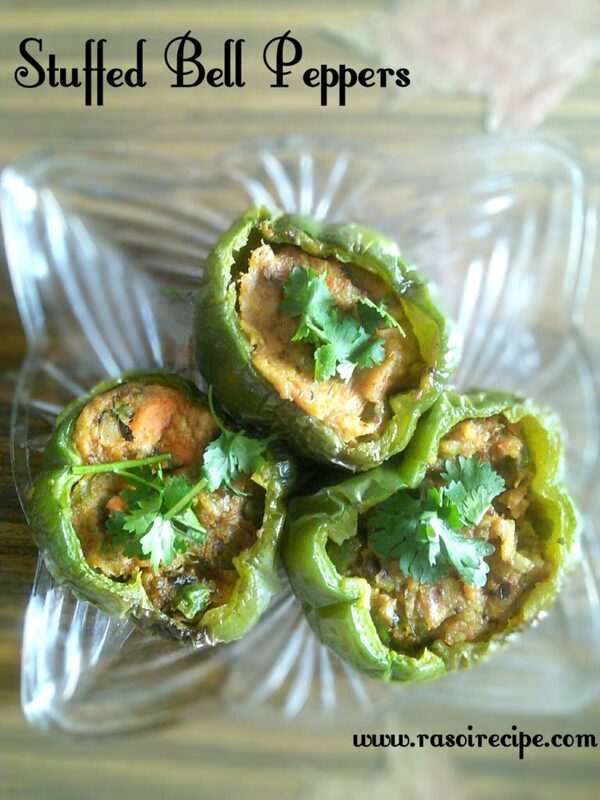 Serve stuffed peppers with hot chapati or paratha. 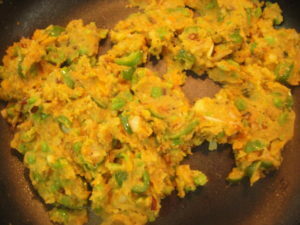 This dish is healthy as the oil which is used for the recipe is only for pan frying or in the stuffing. 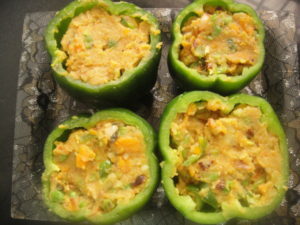 Stuffed capsicum can be served as a side dish or lunchbox dish or starters in parties. It is a quick, easy and delicious recipe. If you have a microwave at home, I would recommend baking of capsicum instead of pan frying. Baking is a healthier option than pan frying. 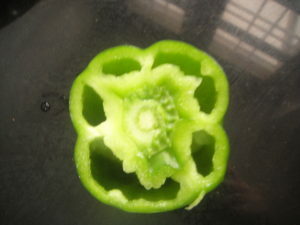 Bell Peppers/Capsicum (Medium size) 4 no. 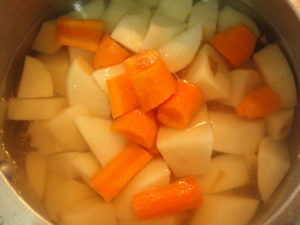 Boiled Potato (medium size) 4 no. Onion (medium size) 1 no. 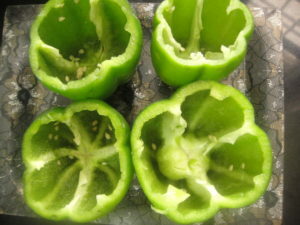 Wash and cut tops of the bell peppers. Remove the seeds. Do not throw away the bell pepper tops. Steam or boil all the vegetables. 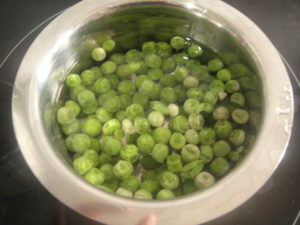 In a bowl mash all the boiled or steamed vegetables. 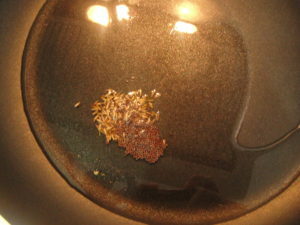 In a deep pan heat oil, add cumin seeds let them crackle. 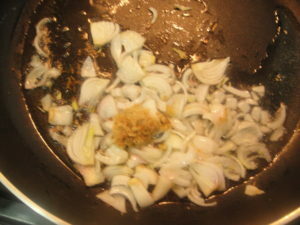 Add chopped onion and crushed ginger in the pan. 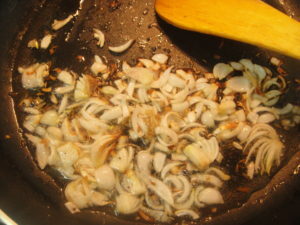 Cook them till onion turns golden brown. 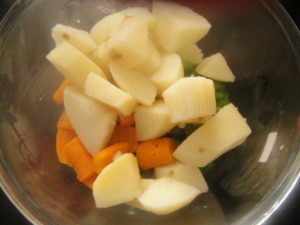 In the frying pan add all the mashed and boiled/steamed veggies in the pan. 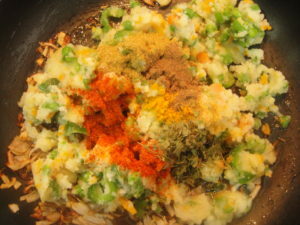 Add all the dry spices, mix everything well. Your stuffing is ready. Now use a spoon and stuff all the bell peppers. Next step is important and totally depends on you, you can either pan fry or bake all the bell peppers. 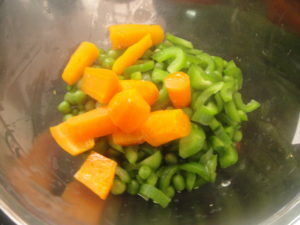 If pan frying heat oil, place all the bell peppers in the pan. Cover the pan and cook on a low flame until done. Keep checking and rotating bell peppers in every 3-4 mins. 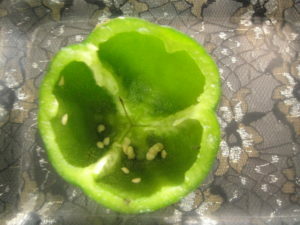 When done bell peppers will turn wrinkled and golden. 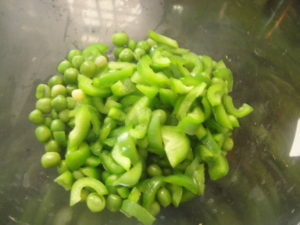 For microwave cooking, preheat oven to 160 C. Place capsicums in the microwave safe tray and cook for 8-10 mins depending on the size of the bell peppers. 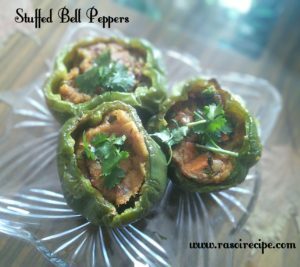 Garnish stuffed bell peppers with coriander and serve hot ! Other stuffing options are cottage cheese or gram flour in place of potatoes. This looks so yumm! I really like the idea of adding paneer instead of potato, I’m trying! Yay ! so happy to hear this. Thanks for sharing it. Will try this soon. This is undoubtedly my favourite recipe of yours so far. I literally found out last week that I actually really enjoy peppers and so I’m definitely open to trying to make something similar to this. You’re so creative! Thank you so much dear for your love and appreciation.